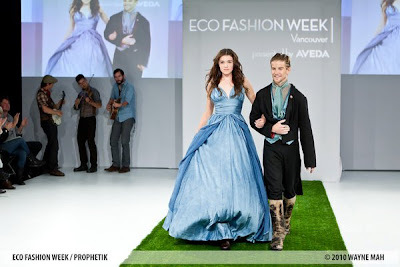 The inaugural season of Vancouver's Eco Fashion Week finished with a blast from the past as Prophetik took centre stage. Hailing from Franklin, Tennessee, designer Jeff Garner finds plenty of inspiration in the lives of rural pioneers and how they had to mend their clothes and make do with what they already had. It was "sustainability borne of necessity," as he puts it. It's not just their spirit of sustainability that Garner finds inspiring but the deeply romantic aesthetic of the past as well. 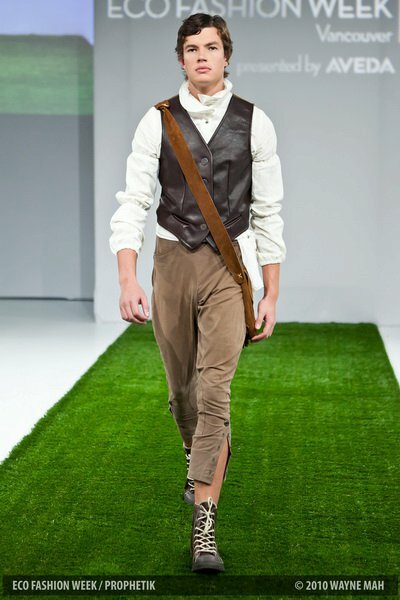 His designs are infused with eclectic historical references ranging from Tennessee pioneers to pirates, Edwardians, and upper-class equestrians. 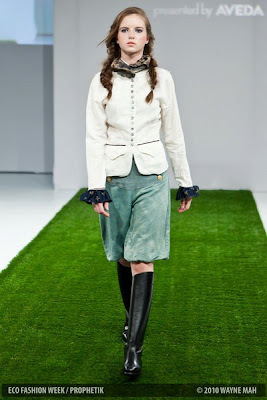 Puffed sleeves, ankle-grazing hemlines, pleats, ruffles, and rows of small buttons lent many of his designs an antique touch. Small details--a backless cut on a long gown, an interesting pleat or drape here and there--kept the effect ethereal and prevented the collection from sliding into "costumey" territory. So what else is remarkable about his designs? 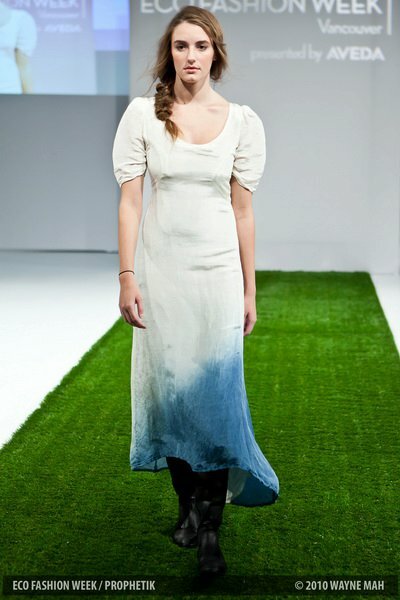 They're all created using sustainable fabrics and plant-based organic dyes in his cabin studio in Tennessee. 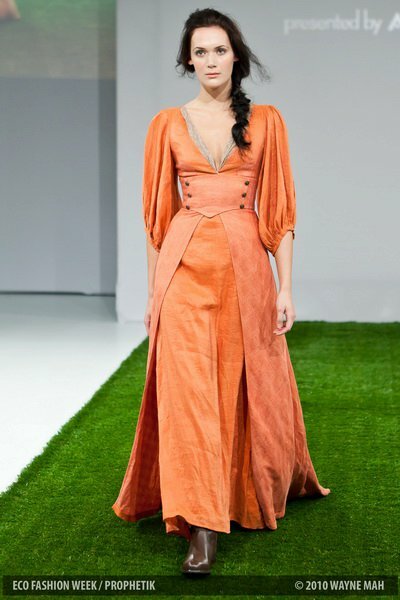 The sumptuous ombré effect and rich hues of Prophetik's gowns and dresses come from nature, not chemicals. 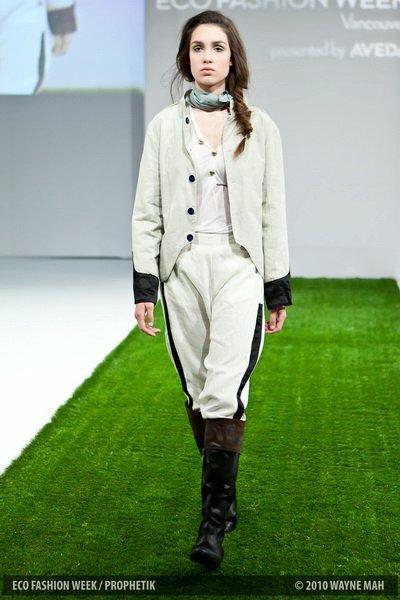 The menswear and equestrian-inspired womenswear had some great pieces. Styled with more contemporary pieces, these items can easily lend a classic yet quirky touch to an ensemble. At the end of the show, Garner himself walked the runway accompanied by a model in a cornflower blue gown (and crinoline!) while a bluegrass band played in the background. With Avatar director James Cameron and his wife Suzy among Garner's growing list of supporters, and a prestigious London Fashion Week debut to launch his career, you can be sure that the buzz around Prophetik will build to a deafening roar. Want to learn more about Garner and Prophetik? 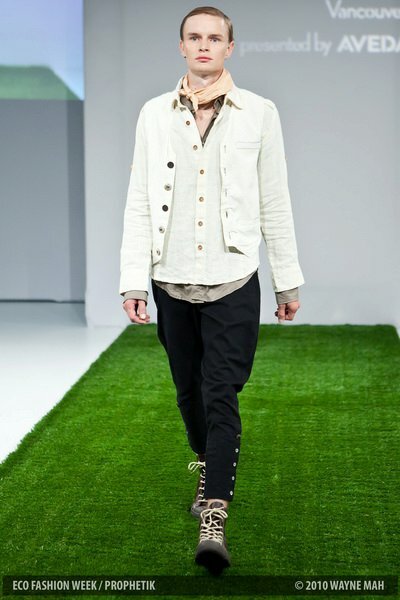 This was the short film that played before his Eco Fashion Week show began. And that concludes my EFWV coverage! I hope you've enjoyed these posts as much as I enjoyed the shows. Kudos to the organizers on a job well done, and to photographer Wayne Mah, who let me use his beautiful runway photos in this post and all the others. These looks are truly beautiful - I love the traditional vibe and that first dress looks almost angelic! Really like the equestrian themed looks as well! 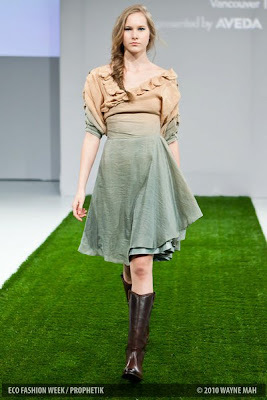 I really love the way this blog supports eco-friendly fashion. I learn so much about green labels from you, and would be so much more in the dark than I am without your blog. That blue dress is stunning, it reminds me of Cinderella! loving all your coverage of eco fashion week! makes me feel like I was there - i was so sad to miss it due to work. 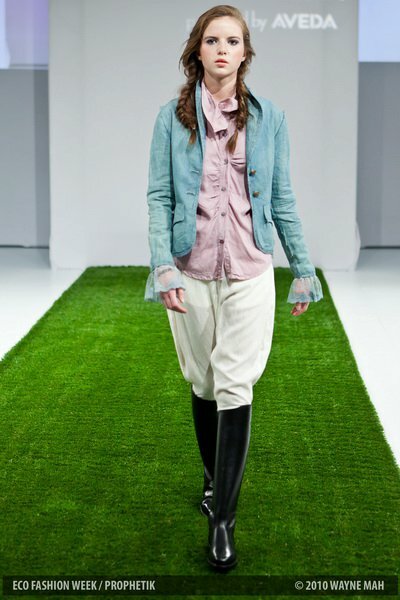 definitely dig the nicole bridgier collection - the colours are beautiful. Those dresses are beautiful. I especially love the ombre effect. I will definirely be checking out Prophetik.